The thunderous sounds of Ancient Rome's chariot races could once more echo around the Eternal City, with plans to stage an event in the Circus Maximus. For hundreds of years, citizens of the Roman Empire watched chariots tear around the famous racetrack in what was the Formula One event of its time. "According to our calculations, the Circus Maximus area could hold up to 35,000 people. If possible, we hope to involve charioteers from all over the world." 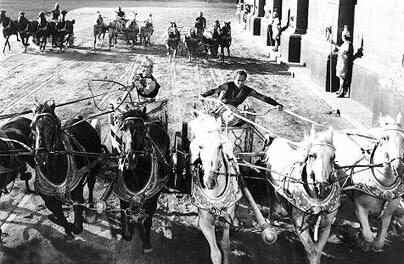 In Ancient Roman times, races were held using either two or four horses but sometimes skilled charioteers would use up to 10 to impress the Emperor. As in modern day Formula One there were various teams and winners would be given wreaths made from laurel leaves, as well as prize money. Successful charioteers were hero worshiped and treated as celebrities but their life expectancy was not very high. The most famous was Scorpus, who won over 2000 races before being killed in a collision at the meta, the column used as a turning point at one end of the track, aged just 27. Horses, too, could become celebrities, but their life expectancy was even lower with many killed or maimed in spectacular crashes. Mr Calo said he hoped the plan would extend beyond the Circus Maximus, which is now being used as a park, with recreations of other pars of Ancient Rome around the city. "All the main squares of the capital would be transformed into scenes from Ancient Rome, using props on loan from the Cinecitta film studios. "Various screens would need to be installed at various points outside the course so that people could watch the races." Restoring the Circus Maximus would include setting up platforms, security exits, a stage at the centre of the course, a ditch and outdoor stables. A city council spokeswoman said: "This is something that has been proposed to us and we are looking into the feasibility of arranging it. "At the moment nothing definite has been arranged, it is merely at the proposal stage and is with both the department of culture and of sport and they will have the final say." Civil authorities would be used to arrange parking and security and riding groups will look after the horses and race training. It would not be the first time that the Circus Maximus has been used as an open air venue. In recent years it has hosted concerts and rallies and in 2006 it was the scene of the welcome home party for the victorious Italian World Cup team, attended by more than a million people. ANABOLIC STEROIDS -- SAFE OR SAVAGE?